Description: Blue and white ribbon, worn as pendant around the neck. White five-armed cross and the Finnish Lion. In the middle of the cross on the obverse the Olympic rings, on the reverse the year 1952. Other information: The Finnish Olympic Cross of Merit and Medal of Merit were instituted by the President of the Republic on 21 July 1951. They were awarded for distinguished service for the Helsinki Olympic Games. 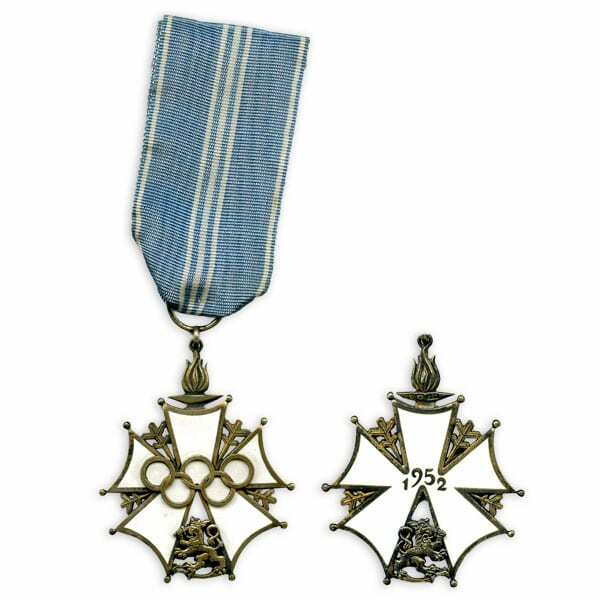 The Cross of Merit, Second Class was awarded to 508 Finnish citizens and 192 foreign nationals.